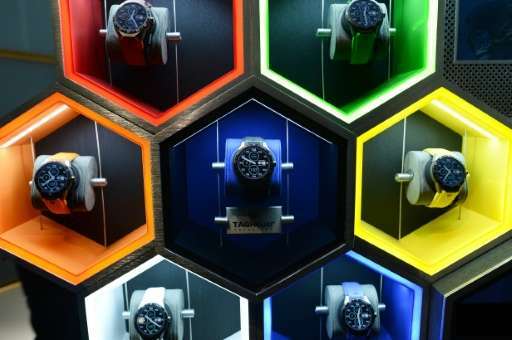 The global market for wearable technology is seeing a surge, led by watches, smart clothing and other connected gadgets, a research report said Thursday. IDC said its forecast showed the worldwide wearable device market will reach a total of 111.1 million units in 2016, up 44.4 percent from this year. By 2019, IDC sees some 214.6 million units, or a growth rate averaging 28 percent. "The most common type of wearables today are fairly basic, like fitness trackers, but over the next few years we expect a proliferation of form factors and device types," said Jitesh Ubrani, an IDC analyst. "Smarter clothing, eyewear, and even hearables (ear-worn devices) are all in their early stages of mass adoption. Though at present these may not be significantly smarter than their analog counterparts, the next generation of wearables are on track to offer vastly improved experiences and perhaps even augment human abilities." IDC said it sees smartwatch sales hitting 34.3 million units in 2016, up from 21.3 million this year. And by 2019, it expects total sales of some 88.3 million devices. "In a short amount of time, smartwatches have evolved from being extensions of the smartphone to wearable computers capable of communications, notifications, applications, and numerous other functionalities," said IDC research manager Ramon Llamas. "The smartwatch we have today will look nothing like the smartwatch we will see in the future. Cellular connectivity, health sensors, not to mention the explosive third-party application market all stand to change the game and will raise both the appeal and value of the market going forward." IDC said in its most recent quarterly update that some 21.7 million wearables were sold in the past quarter, a jump of 197 percent. Fitness tracker maker Fitbit maintained the top spot with a 22.2 percent market share and unit sales of 4.7 million, according to IDC.